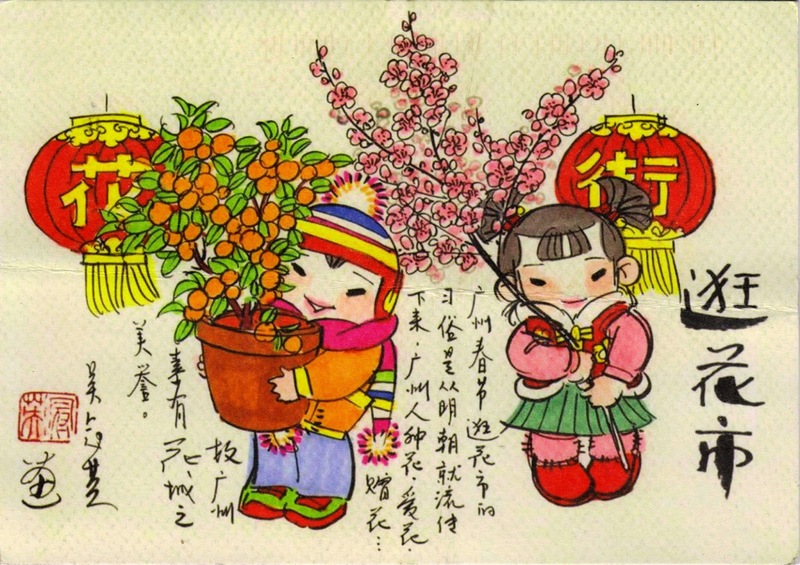 I just got this postcard from a private swap showing a pair of kids in traditional Chinese costume at a flower market in Guangzhou, China. The Guangzhou Flower Market, held annually during the Spring Festival, is a city-wide street fair where the public can purchase all kinds of flowering and decorative plants as part of the Chinese New Year celebration. As vendors literally line up the streets, the Flower Market is also known to locals as the "Flower Streets" where you can go shopping flowers by "walking the Flower Streets." The tradition can be traced back to the Ming Dynasty (1368–1644). Peony, orchid, and related arts, crafts and supplies are popular items in the market.